The 2007 Cricket World Cup (officially known as ICC Cricket World Cup 2007) was the 9th edition of the Cricket World Cup tournament that took place in the West Indies from 13 March to 28 April 2007, using the sport's One Day International (ODI) format. There were a total of 51 matches played, three fewer than at the 2003 World Cup (despite a field larger by two teams). The 16 competing teams were initially divided into four groups, with the two best-performing teams from each group moving on to a "Super 8" format. From this, Australia, New Zealand, Sri Lanka, and South Africa won through to the semi-finals, with Australia defeating Sri Lanka in the final to win their third consecutive World Cup and their fourth overall. Australia's unbeaten record in the tournament increased their total to 29 consecutive World Cup matches without loss, a streak dating back to 23 May 1999, during the group stage of the 1999 World Cup. The tournament also saw upsets in the first round with tournament favourites India and Pakistan failing to advance past the group stage. The following day police announced that the death of Bob Woolmer was suspicious and ordered a full investigation. Following the tournament the ICC distributed surplus tournament revenues of US$239 million to its members. The World Cup was awarded to the West Indies via the International Cricket Council's rotational policy. It is the first time the ICC Cricket World Cup has been held in the Caribbean despite the fact that the West Indies cricket team had been the second most successful team in past World Cups. The United States contingent lobbied strongly for matches to be staged at its newly built cricket ground in Lauderhill, Florida, but the ICC decided to award all matches to Caribbean nations. Bids from Bermuda, St. Vincent and the Grenadines, and a second bid by Jamaica were also rejected. Eight venues across the West Indies were selected to host the World Cup tournament. All host countries hosted six matches with the exceptions of St. Lucia, Jamaica, and Barbados (which hosted the final), each of which hosted seven matches. The Jamaican government spent US$81 million for "on-the-pitch" expenses. This included refurbishing Sabina Park and constructing the new multi-purpose facility in Trelawny through a loan from China. Another US$20 million was budgeted for 'off-the-pitch' expenses, putting the tally at more than US$100 million or JM$7 billion. This put the reconstruction cost of Sabina Park at US$46 million whilst the Trelawny Stadium was estimated to cost US$35 million. The total amount of money spent on stadiums was at least US$301 million. Brian Lara Stadium, in Trinidad, lost its status as a pre-tournament warm-up match venue on 21 September 2006. The field of 16 teams, the largest ever for the Cricket World Cup, consisted of all 16 teams which currently held ODI status. This included the ten full members of the ICC, all of which have Test and permanent ODI status. The other six (associate) ODI nations were Kenya (which had ODI status until 2009) and five additional teams (previously three) that qualified via the 2005 ICC Trophy (gaining ODI status until 2009 in the process). These nations included Scotland who won the ICC Trophy, Canada, the Netherlands, and—making their World Cup debuts—Ireland and Bermuda. The sixteen teams were each asked to announce their final squads by 13 February 2007. Changes were allowed after this deadline at the discretion of the ICC's Technical Committee in necessary cases, such as due to player injury. The official mascot of the tournament was Mello, an orange, anthropomorphic, raccoon-like animal. The World Cup had grown as a media event with each tournament. The sponsorship and television rights that were awarded primarily to cover the 2003 and 2007 World Cups raised over US$550 million. The 2007 World Cup was televised in over 200 countries to a viewing audience estimated at more than two billion viewers and was expected to generate more than 100,000 unique visitors to the West Indies travelling solely for the tournament. The 2007 Cricket World Cup featured an orange, anthropomorphic raccoon-like creature named "Mello" as its mascot. It was announced during matches that Mello had no race, species, age or gender—it was an attitude, the attitude of the young people of the West Indies. The official song for the World Cup was "The Game of Love and Unity" by Jamaican-born Shaggy, Bajan entertainer Rupee, and Trinidadian Fay-Ann Lyons. The 2007 tournament recorded the highest ticket sales for a Cricket World Cup, selling more than 672,000. Attendance leading into the semi-finals for the 2007 World Cup was 403,000, an average of 8,500 supporters per match. All major Test-playing nations had schedules allowing them to play a large number of ODI matches against other major ODI teams just prior to the World Cup. Australia, New Zealand, and England took part in the Commonwealth Bank Series where England defeated Australia in the finals. Australia then went to New Zealand for the Chappell–Hadlee Trophy, losing 3–0. South Africa played five ODIs against India (South Africa won 4–0) and five against Pakistan (South Africa won 3–1), while India also played four ODIs against the West Indies (India won 3–1) and four ODIs against Sri Lanka (India won 2–1). Bangladesh played four ODIs against Zimbabwe (Bangladesh won 3–1) and won a tri-series against Canada and Bermuda. The associate ODI teams took part in the World Cricket League, which Kenya won, and were also involved in other series prior to the World Cup. Note:Teams 12–16 did not have official ODI rankings leading up to the World Cup; they are ranked based on their win percentage against full members and then wins against associate members prior to the tournament. Prior to the main tournament all 16 nations played a series of warm-up matches to prepare, experiment with different tactics, and to help them get acclimated to conditions in the West Indies. The warm-up matches were not considered as official ODIs. The matches were played from Monday 5 March until Friday 9 March. Alison Hinds performing during the ceremony. The ICC Cricket World Cup 2007 Opening Ceremony was held on Sunday, 11 March 2007, at Trelawny Stadium in Jamaica. It featured over 2,000 dancers and performers representing all strands of West Indian music, from calypso and ragga to reggae and soca. Among the performers were Sean Paul, Byron Lee, Kevin Lyttle, Beres Hammond, Lucky Dube, Buju Banton, Half Pint, Arrow, Machel Montano, Alison Hinds, Tony Rebel, Third World, Gregory Isaacs, David Rudder, Shaggy, the I Threes, and Jimmy Cliff. The ceremony, attended by several heads of state including the Governor-General of Jamaica, started with an address by Sir Garfield Sobers and included messages from the prime ministers of Jamaica and Grenada. The matches were One Day Internationals and operated under normal ODI rules. All matches were to be 50 overs a side unless stated otherwise by the umpires or match referee. A bowler was able to bowl a maximum of 10 overs per match. In the event of bad weather, each side must have batted a minimum of 20 overs for a result to be declared (if the match was not otherwise won, for example if the team batting second were dismissed before the completion of 20 overs). In the event of bad weather, the Duckworth-Lewis method was to be applied to determine the result or target. If no result was declared on the scheduled day, the teams would return the following day to complete the game, with the same situation as when the game was abandoned. There was a new rule regarding referral of catches to the TV replay official (third umpire): if the standing umpires were unable to determine whether a catch had been taken cleanly, and/or whether a claimed catch was a "bump ball", they had discretion to refer the decision to the third umpire. Also, whilst reviewing such a catch via TV replay if it was clear to the third umpire that the batsman did not hit the ball, he was to indicate that the batsman was not out. The umpiring panel for the 2007 Cricket World Cup comprised nine umpires from the Elite Panel of ICC Umpires (the only member not included was Darrell Hair), and nine umpires from the international panel. The refereeing panel consisted of seven members from the Elite Panel of ICC Referees, with Clive Lloyd not being included due to his role as the West Indies's team manager. Aleem Dar went on to stand as an umpire in his first World Cup final, alongside Steve Bucknor who appeared in his fifth final in a row, extending his record of four from the 2003 World Cup. The tournament began with a league stage consisting of four groups of four. Each team played each of the other teams in its group once. Australia, India, England, and the West Indies were placed in separate pools for logistical reasons, as they were expected to have the most supporters in attendance, and transport and accommodation capacity in the West Indies was limited. The groups are listed below, with seedings (rankings from April 2005) shown in brackets. Each group played all of its matches at a single ground. The tournament was preceded by a number of warm-up matches to acclimate the players. The group stage matches started on Tuesday 13 March and finished on Sunday 25 March. There were a total of 24 matches played in the group stage. The top two teams in each group proceeded to the "Super 8" stage which also used a league system. Each team carried forward its result against the other team qualifying from its preliminary stage group, and played the other six qualifying teams once each. The top four teams in the league qualified for the semi-finals. This system was modified since the previous World Cup, which had a "Super 6" stage rather than a Super 8. The Super 8 stage matches were played from Tuesday 27 March until Saturday 21 April. A total of 24 matches were played in the Super 8 stage. The top four teams in the "Super 8" advanced to the semi-finals. This was the knockout stage, with the No. 1 team playing the No. 4 team, and the No. 2 team playing the No. 3 team in the tournament. The winners of the two semi-finals played each other in the Final. All tournament matches had one reserve day (the day after the scheduled day of the match) to allow for matches to be completed in the event of bad weather. The top two teams in each first-round group moved on to a "Super 8" stage which was scored as a complete round-robin. However, each of the eight teams played only six new matches, rather than seven—each group's two representatives carried forward their result against each other rather than play again. Thus the table below, showing seven matches for each team, covers all matches between the Super 8 qualifiers, including those from the Group Stage. Teams depicted in green backgrounds qualified for the semi-finals. This was the first World Cup final to be a repeat: the sides previously met in the 1996 World Cup final, which Sri Lanka won. Australia had won every World Cup match against Sri Lanka apart from that loss. The match was Sri Lanka's second World Cup final appearance, and Australia's fourth in a row and sixth overall. 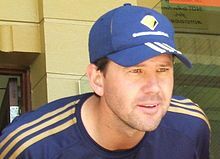 Australian captain Ricky Ponting won the toss and elected to bat. However, the start of play was delayed due to rain, and the match was reduced to 38 overs per side. Wicketkeeper Adam Gilchrist played an incredible innings of 149—the highest for any batsman in a World Cup final—to give Australia an imposing total going in at the break. A large crowd of over 10,000 fans welcome the Australian team on completing the first World Cup hat-trick – Martin Place, Sydney. While Sri Lankan batsmen Kumar Sangakkara and Sanath Jayasuriya were adding 116 for the second wicket, the contest was alive, but after the pair got out, Sri Lanka's chances slowly diminished. Further rain forced the reduction of Sri Lanka's innings to just 36 overs, with the target revised to 269. At the end of the 33rd over, with Sri Lanka still trailing the adjusted Duckworth-Lewis target by 37 runs, the umpires suspended the game due to bad light. While Australia's players began to celebrate their victory (since the minimum 20 overs had been reached), the umpires incorrectly announced that because the match was suspended due to light and not rain, the final three overs would have to be bowled the following day. With Sri Lanka needing 61 runs from 18 deliveries, Sri Lankan captain Mahela Jayawardene agreed there was no need to return the following day, and instructed his team to resume batting; Ponting agreed to play only spin bowlers. The last three overs were played in almost complete darkness, during which Sri Lanka added just nine runs to give Australia a 53-run victory by the D-L method. The umpires later apologised for their error, saying that the match should have ended then with Australia winning by 37 runs. Australia won the tournament undefeated, extending their streak of World Cup matches without a loss to 29. Australian bowler Glenn McGrath was named 'Player of the Series'. Pakistan coach Bob Woolmer was found dead on 18 March 2007, one day after his team's defeat to Ireland put them out of the running for the World Cup. Jamaican police performed an autopsy which was deemed inconclusive. The following day police announced that the death was suspicious and ordered a full investigation. Further investigation revealed the cause of death was "manual strangulation", and that the investigation would be handled as a murder. After a lengthy investigation the Jamaican police rescinded the comments that he was murdered, and confirmed that he died from natural causes. The 2007 World Cup organisers were criticised early on for being over-commercialised and, in particular, the generally smaller crowds have been blamed on the ICC's security restrictions on things such as outside food, signs, replica kits, and musical instruments, despite Caribbean cricketing customs, as well as the authorities being accused of "running [cricket and cricketing traditions] out of town, then sanitising it out of existence". Sir Viv Richards echoed the concerns. The ICC were also condemned for high prices of tickets and concessions, which were considered unaffordable for the local population in many of the locations. ICC CEO, Malcolm Speed, said that the ICC recognised the problem but said it was the local organisers' fault. However, the later matches had more crowds as the tournament progressed with the local organisers easing restrictions. Although it did not meet the target of US$42 million, the US$32 million revenue from ticket sales was the highest of any Cricket World Cup and double that of the previous World Cup. The World Cup was also criticised by the BCCI for its format because India failed to move on from the group stage after losing two of their three matches. The BCCI later claimed it would see to it that the ICC alter its format for the 2011 Cricket World Cup. The elimination of both India and Pakistan also caused a large exodus of subcontinental fans from the Caribbean, and removed the prospect of an India vs Pakistan Super Eights match, generally considered one of the most revenue generating and electric matches in the tournament. The tournament was also criticised as being too long. At 6 weeks, it was the same length as the 2003 World Cup, but longer than the 5-week 1999 World Cup and the 4-week 1996 World Cup. The famous West Indian fast bowler Michael Holding also criticised the qualification process for the 2007 World Cup. Holding expressed doubts over the benefit to less-established teams of turning up and being heavily defeated. However, former Scotland captain George Salmond claims that the opportunity to play one-day cricket against the bigger teams is invaluable for smaller teams such as his own, and questioned the validity of Holding's statements. The majority of the experts and players participating in the tournament backed up the smaller teams taking part in the World Cup. This was further backed up with Ireland and Bangladesh making the Super 8s and being competitive and sportsmanlike throughout the tournament. Further criticism was generated by the confusion at the end of the final match: the umpires announced that play was suspended due to bad light, which caused the Australian team to erupt in celebration as the scoreboard and official announcements declared Australia the winners. However, the umpires incorrectly insisted that the game was only suspended and not completed, and that 3 overs remained to be played, so in farcical light conditions, Sri Lanka batted out the remaining 3 overs following a gentleman's agreement between the two captains. The umpires and the ICC apologised for the unnecessary situation and cited it as an unnecessary fundamental error due to the pressure of the situation. In June the ICC announced that the officials involved—onfield umpires Steve Bucknor and Aleem Dar, reserve umpires Rudi Koertzen and Billy Bowden, and match referee Jeff Crowe—would all be suspended from the 2007 Twenty20 World Championship. A number of preparation problems surfaced before the start of the World Cup. Some of the venues were not complete by the opening ceremony on 11 March 2007. At Sabina Park, seats had to be removed at the newly constructed north-stand due to safety concerns. At Trelawny Stadium in Jamaica, ground staff were unable to gain admission to the ground during the warm-up matches due to accreditation problems. Additionally, South Africa and Australia both expressed concerns over practice facilities. ^ a b "Woolmer's post-mortem inconclusive". CricInfo. 20 March 2007. Retrieved 23 March 2007. ^ a b "Woolmer's death 'suspicious' – police". CricInfo. 21 March 2007. Retrieved 23 March 2007. ^ ICC Consolidated Financial Statements for the 9 months ended 31 December 2007, accounting note 12. ^ In terms of number of wins, win percentage, and number of cups won. In fact, they were on top on all of these criteria from 1975 to 1987, and only in 2003 did Australia pass their number of cups won. ^ "Robert Bryan, executive director, Jamaica 2007 Cricket Limited (from http://www.jamaica-gleaner.com)". Archived from the original on 27 September 2007. Retrieved 9 April 2007. ^ "Cricket: 'Run wid it again!'". 24 April 2006. Archived from the original on 12 March 2007. Retrieved 9 April 2007. ^ Mark Pouchet (21 September 2006). "Brian Lara stadium exits World Cup". Cricinfo. Archived from the original on 14 March 2007. Retrieved 9 April 2007. ^ "Sponsorship revenue". Archived from the original on 9 March 2007. Retrieved 9 April 2007. ^ "Taipai Times Editorial". Archived from the original on 23 March 2007. Retrieved 18 April 2007. ^ "World Cup Overview". cricketworldcp.com. Archived from the original on 24 January 2007. Retrieved 29 January 2007. ^ a b "World Cup profits boost debt-ridden Windies board". Content-usa.cricinfo.com. Retrieved 16 August 2013. ^ a b "ICC CWC 2007 Match Attendance Soars Past 400,000". Cricketworld.com. 24 April 2007. Archived from the original on 28 September 2007. Retrieved 25 April 2007. ^ Fitzgerald, James (13 February 2007). "Scotland top of ICC Associate ODI Rankings after WCL Div. 1". ICC. Archived from the original on 19 February 2007. Retrieved 11 March 2014. – Note: The ODIs in the WCL Division 1 were the last ODIs played by associates before the World Cup. ^ long, Jon (19 July 2005). "ICC Cricket World Cup 2007 match schedule announced". ICC. Archived from the original on 16 April 2007. Retrieved 9 April 2007. ^ "All set for grand opening of cricket's biggest showpiece". Indianmuslims.info. Archived from the original on 7 February 2012. Retrieved 16 August 2013. ^ a b "ICC Cricket World Cup 2007 Playing Conditions" (PDF). Archived from the original (PDF) on 26 February 2007. Retrieved 27 February 2007. ^ "World Cup seedings plan announced". Archived from the original on 26 September 2007. Retrieved 9 April 2007. ^ "Australia v Sri Lanka: World Cup Series Summary". Cricinfo. Retrieved 28 April 2007. ^ a b "Gilchrist leads Australia to World Cup treble". Cricinfo. Retrieved 6 May 2007. ^ "World Cup final scorecard". Cricinfo. Archived from the original on 30 April 2007. Retrieved 30 April 2007. ^ "World Cup Referee apologize". Cricinfo. Retrieved 30 April 2007. ^ "Australia v Sri Lanka, World Cup final, Barbados". Cricinfo. Retrieved 30 April 2007. ^ "ICC World Cup – Final". Cricinfo. 28 April 2007. Archived from the original on 30 April 2007. Retrieved 28 April 2007. ^ Raedler, John. "Woolmer was strangled, police say". cnn. Archived from the original on 25 March 2007. Retrieved 24 March 2007. ^ "Pakistan Woolmer death treated as murder". BBC. 23 March 2007. Archived from the original on 26 March 2007. Retrieved 23 March 2007. ^ "Woolmer 'dIED OF NATURAL CAUSES'". BBC. 12 June 2007. Archived from the original on 29 June 2007. Retrieved 12 June 2007. ^ Tim de Lisle (3 April 2007). "A public relations disaster". Cricinfo. Retrieved 24 May 2007. ^ Mike Selvey (5 April 2007). "Weep for the ghosts of calypsos past in this lifeless forum". The Guardian. London. Retrieved 24 May 2007. ^ "Richards attacks Cup organisation". BBC. 5 April 2007. Archived from the original on 6 May 2007. Retrieved 24 May 2007. ^ "Crushing the essence of the Caribbean". Cricinfo. 5 April 2007. Archived from the original on 19 May 2007. Retrieved 24 May 2007. ^ "Quote ... unquote". Cricinfo. 2007. Archived from the original on 16 May 2007. Retrieved 30 April 2007. ^ "Barbados determined to restore local flavour". Cricinfo. 5 April 2007. Retrieved 24 May 2007. ^ "Ticket sales double of previous World Cup – Dehring". Cricinfo. 16 April 2007. Archived from the original on 18 April 2007. Retrieved 30 April 2007. ^ "Former BCCI chief blames format for India's exit". Rediff.com. 27 March 2007. Retrieved 16 August 2013. ^ "Holding slams World Cup minnows". 20 February 2007. Archived from the original on 1 March 2007. Retrieved 9 April 2007. ^ "ICC associates hit back at Holding for his remarks". Cricket.indiatimes.com. Archived from the original on 2 April 2007. Retrieved 16 August 2013. ^ "Bermuda have 'wonderful experience' in huge loss". Cricinfo. 16 March 2007. Archived from the original on 19 March 2007. Retrieved 9 April 2007. ^ Fitzgerald, James (22 April 2007). "Ireland ranked tenth in LG ICC ODI Championship". ICC. Archived from the original on 28 April 2007. Retrieved 11 March 2014. ^ "Awesome Australia but awful organising". Cricinfo. 28 April 2007. Archived from the original on 1 May 2007. Retrieved 30 April 2007. ^ "Speed apologises for light chaos". Cricinfo. 28 April 2007. Archived from the original on 2 May 2007. Retrieved 30 April 2007. ^ "World Cup officials banned by ICC". Cricinfo. 22 June 2007. Retrieved 24 June 2007. ^ "Some Cup venues still not ready". 11 March 2007. Archived from the original on 5 May 2007. Retrieved 9 April 2007. ^ "A week before the opening Cricket World Cup game, chinks appear at Sabina Park". 11 March 2007. Retrieved 9 April 2007. ^ Mike Atherton (12 March 2007). "Hosts hope calm is not followed by a storm". The Sunday Telegraph. London. Archived from the original on 20 March 2007. Retrieved 9 April 2007. ^ "Warmup matches start amid last minute preparations". 4 March 2007. Archived from the original on 27 April 2007. Retrieved 9 April 2007. Wikimedia Commons has media related to 2007 Cricket World Cup.